Unless you've been living under a rock I'm sure you are all aware that the Olympics just ended. 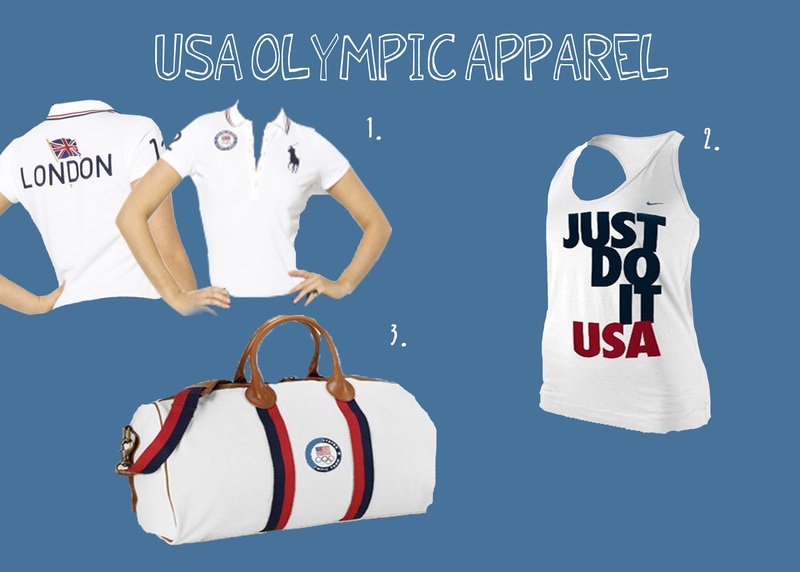 I've been eyeing all of the Olympic merchandise for a while now and now that a week or so has passed we are finally starting to see the sales (sorry Ralph Lauren this poor college student cannot afford a $145 dollar polo). So now that the prices are dropping, its time for me to hit the stores and get my Olympic merchandise fix. I've been crushing on these three items since before the Olympics and I'm happy to say that I've been able to now buy the two shirts without breaking the bank. The bag unfortunately is still on my "saving for" list. Funny story, I was wearing my Olympic polo while out shopping with my mom and sister the other day and when I walked away from the cash register to grab a last minute buy the cashier asked my mom "She's an Olympian? What sport did she play?" I'm sure you can imagine how my mom and my sister burst out into laughs at the thought of me being an Olympic Athlete. They didn't skip a beat to correct her and let her know that I was just a crazy Olympic fan who bought a shirt. Needless to say this is one of the best compliments I've received. Yay for sales! Aren't you smart to wait??? ?